When my friend Melanie showed me a cool gadget that she found on Marketplace yesterday, I said I have to share this with everyone on my blog! I’ve been playing with facial emotes for years, usually via an emotes menu that comes with a scripted gadget or a free HUD (found on Marketplace). Back in June, I even spent $350L to purchase an eye focusing HUD to keep my eyes still or moved them into a different position for some pictures. I thought it was a great investment at the time, and even recommended it to a few friends. Well, the FREE AnyPose Expression HUD that Melanie showed me does ALL of this… and MORE. This HUD has all the default facial emotes that can be played one at a time, or several at once to create a unique look. The HUD is even scripted to focus eyes and change to different hands poses — so you can make any pose in SL more interesting. This is a fashion blogger’s dream HUD and I’m just amazed that it’s FREE and not $300-$500L, which I would have willingly paid for to have a single HUD that does it all. For today’s post, I took off all of my prim lashes and used Mozz Tattoo Lashes cos I didn’t feel like re-adjusting my lashes for all the different facial emotions. Normally I just adjust my prim lashes to fit — so I have a few in my inventory for “smiling” emotes. I hope you guys find this HUD review useful, and do check it out, it’s amazing! Grrr I can’t find it on the marketplace. I swear, your blog is like my SL bible. Another great use for this HUD is when your hands are stuck spread. Put on the HUD, click a couple of hand positions and then reset them to relax. Works every time. You are wonderful. Thank you for informing us. Great stuff! I love seeing that random freebie on your blog that’s amazing and functional. Thanks for this. Up untill now I have been using the other hud you mentioned, but it’s a bit limited. Many thanks for the review! I thought a long time on price… and decided that it would be better as advertisement for my other HUDs. Thank you for sharing, this gadget is AMAZING! Thanks Gogo, a super find for sure! If the creator could just develop it so you could control another person too, that’d make it absolutely perfect. 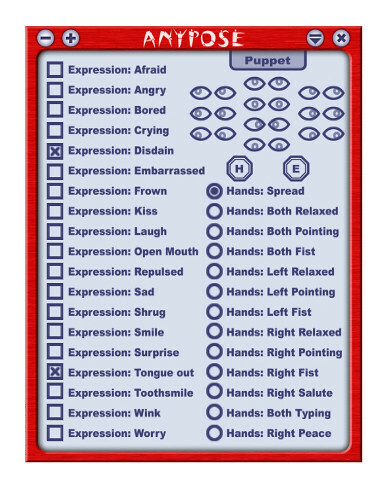 Just read the product description and the ‘puppet’ mode does allow you to control another avatar… totally perfect! Anybody know how to make the hand poses work? Most common cause of hand poses not working is a ring. Many rings have mini AOs in them that repeatedly play the relaxed hand pose so that the ring doesn’t float in mid air. OMG! Thank you so very very very much for posting this! I’m somewhat of an SL Photographer and most of the time is spent trying to get the daggone eyes right! I told my daughter about it and she went out and got it right away as well!